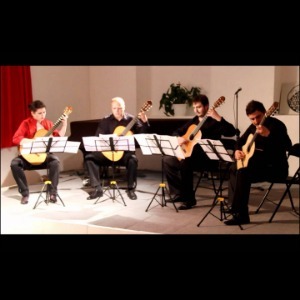 Chamber ensemble Laurum was founded in late 2011, and consists of guitarists Tamara Perc, Hrvoje Ton, Antonio Rumenović and Vlade Brzović. Laurum acts as a guitar quartet, and what the members have in common is the fact that each of them has completed his or her study with the renowned guitarist and pedagogue prof. Carlo Marchione. Hence comes their mutual acquaintance and the desire to gather in a joint music-making. Members of the ensemble, in addition to being very successful educators, also act as members of the jury committees at international competitions across Croatia. As part of guitar events, they have been invited to lead master classes. The ensemble performs works of composers from different epochs and parts of the world, and they expand their repertoire with covers, as well as with compositions made by the members themselves. That part of the repertoire includes a cover of the Christmas concert op. 8 no. 6 by a baroque composer G. Torelli and a composition Puls plus by Hrvoje Ton, and this year Laurum will expand their program with another new copyright song, Rock suite by Vladimirus Brzović.In the coming period, in addition to concert activities, Laurum is planning their first CD recording. Their first noted performance was at the Third international guitarist festival – Omiš Guitar Fest 2012, where they performed in front of two hundred guitarists from all around the world, and in front of the President of the Republic of Hrvatska, dr. Ivo Josipović. This was followed by solo concerts in Vrsar, Poreč, Koprivnica, Solin, Lipik, Bjelovar, Zagreb and Križevci - at the first annual Days of Guitar. Further prominent concerts were held at the Fourth Omiš Guitar Fest, the Fifth Poreč tirando and at the Second Pula guitar festival.